The shutdown has closed Muir Woods. Here’s where you can see Redwoods instead. 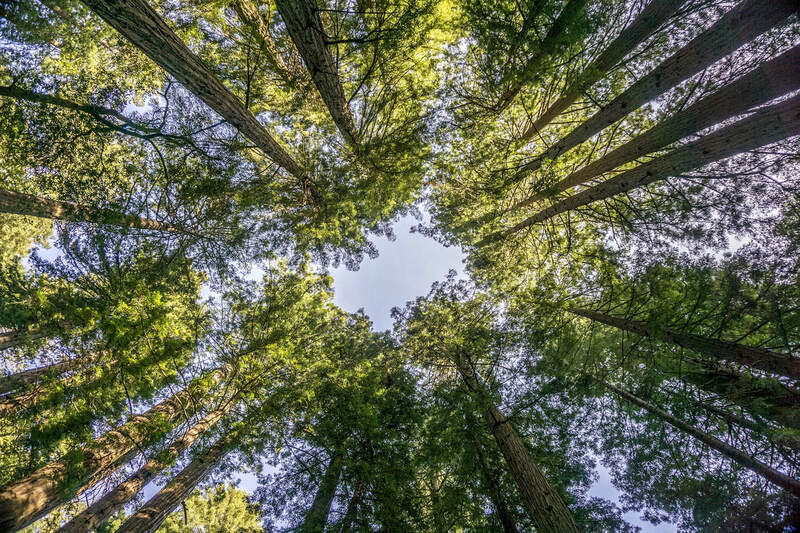 You’ve spent months planning a vacation to San Francisco and, with good reason, Muir Woods is on your list of places to visit. The pocket of old-growth redwoods a short drive from San Francisco is one of the top tourist attractions in the area. But the National Park Service announced that Muir Woods will be closed indefinitely starting Monday, January 7. Parking lots, restrooms and visitor services will be shut down due to the government shutdown. Oh no, you say, how am I going to see the majestic redwood trees? Don’t worry, we’ve got your back. Check out our top five places to see towering redwood trees while Muir Woods is closed. A few options are within a 10-minute drive of Muir Woods, including a secret back door entrance to the monument. A beautiful and mostly flat area of redwood forest with wide, accessible trails just minutes from the Russian River. Make a giant loop from San Francisco, driving along Highway 1 past Point Reyes and Bodega Bay, then come back to the city on Highway 101 for a faster return. For another day trip from the city, head south to either Big Basin or Henry Cowell State Park. For a bonus, the creeks through both of these parks will be spectacular following the heavy rains. For a longer but very worthwhile detour, include the popular and hip beach town of Santa Cruz. This is one of our favorite summer camping spots, located about 45 minutes north of the city. It has some great hiking through stately redwoods, too. Pay the day fee at the front gate and pick up a trail map. You’ll be surrounded by redwoods before even leaving the parking lot! Believe it or not, you don’t ever have to leave the city to bathe in a grove of gentle giants, though they aren’t as tall in the park. Head to Hoover Redwood Grove with plenty of parking off of MLK Drive or Aids Memorial Grove, one of our favorite hidden spots situated on the eastern side of the park near the Conservatory of Flowers. If you’re intent on trying to get into Muir Woods and you have the stamina for a 5-mile hike with elevation changes, this is your best bet. Find the Panoramic Trail across from the Mountain Home Inn on Mount Tamalpais and follow signs for Muir Woods. You might encounter trail closures before making it all the way down to the forest floor (i.e. the main paved trail through Muir Woods), but you will be immersed in redwood forest long before. An alternative lies a few miles further on Panoramic Highway. Hop on the challenging 4.6 mile Dipsea-Steep Ravine Loop starting from the Pantoll Campground parking area. Big news! We’ve got a new logo to unveil and couldn’t be more excited to show it off. We’ve matured a little — don’t worry, you’re guide Brendan is still as funny as ever — and thought the time was right to create a logo that gives people a taste of our San Francisco tour company. Showcasing the vibrant city of San Francisco and some of the highlights of our tour was the easy part. But to boil down our core mission and personality into one image took much more time. Our design goal was to create a logo that captures the spirit of SF Excursions with a nod to a few of our favorite places. The truth is, we’re obsessed with our city and wanted to show off some of the most popular stops on our tours. From the iconic Golden Gate Bridge to colorful victorian houses, majestic redwood trees of Muir Woods and the heart of downtown, the logo brings it all to life. Oh, and of course our van, which visitors love cruising in as they experience the city and Marin County like a local. And last but not least, we chose the font. This step was a little tricky, and required our nerdy side to come out, but we finally landed on a custom font that’s clean, modern and fun. We’re thrilled with the result! What do you think? Send us your feedback, and better yet, book a tour to see how the fun look and feel of our logo is an extension of our one-of-a-kind tours. In 1962 three men left behind dummy heads in their bunks and used makeshift rafts made from old raincoats to make their escape into the icy San Francisco Bay. Less than a year later, due to deteriorating buildings and high costs of maintaining a maximum security prison on an island, Alcatraz Federal Penitentiary closed its final cell door. Alcatraz Island didn’t open up to the public until almost 10 years later in 1972. 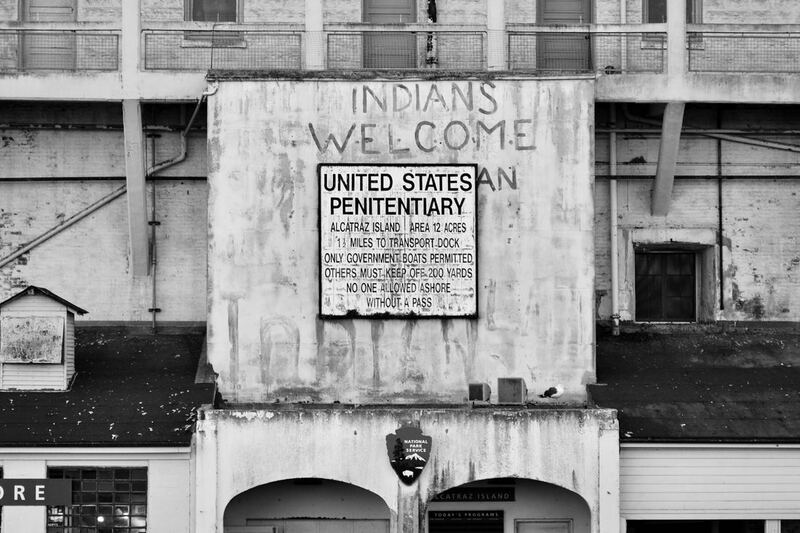 We wouldn’t even be able to visit this former Civil War Era fortress turned federal prison if it hadn’t been for a bold 19 month occupation of the island by Indian American students at San Francisco State University (Go, Gators!) led by activist and student Richard Oakes. If you look closely, you’ll find historic graffiti that has been preserved from the Indian Occupation of Alcatraz. Our personal favorite piece of graffiti is at the entrance to Administration Building (the audio tour takes you through this entry). Look for the eagle above the door, it’s perched on a shield with the American flag and looked between the stripes where you will find the word “FREE”. WHEN DOES THE DAY TOUR RUN? The Alcatraz day tour runs everyday, except for Thanksgiving, Christmas and New Years. Departure times vary depending on season, but always begin around 9am. HOW MUCH DOES THE ALCATRAZ DAY TOUR COST? HOW LONG IS THE DAY TOUR? You’re welcome to stay as long as you like. Or at least until the last ferry leaves! Most folks explore for about two hours before heading onto a ferry back to the city. You can leave on any ferry back to San Francisco, only the ferry to ride to Alcatraz is scheduled. WHAT IS INCLUDED IN THE ALCATRAZ DAY TOUR? Tickets to Alcatraz during the day include a ferry ride to Alcatraz and one back to San Francisco, as well as an audio tour of the cell house. This audio tour is unlike any others, because this was the first. The Alcatraz audio tour was produced by a local interactive non-profit theatre company after interviewing former inmates, guards who watched over the infamous Birdman of Alcatraz and children who grew up on the island — in the shadow of the San Francisco prison. Many of the voices you’ll hear have since passed away. Some of the voices you might recognize in the gift shop. Guest authors can often be found signing books and answering questions in the gift shop. There are various ranger led tours throughout the day — but the schedules aren’t posting until the day of on the island. So be sure to check for extra tours led by rangers and historic interpreters as soon as you’re on the dock of Alcatraz! WHERE CAN YOU BUY DAY TOUR TICKETS FOR ALCATRAZ? You can only buy Alcatraz tickets through Alcatraz Cruises, the only official ferry operator to Alcatraz, or from official third parties — like us here at SF Excursions! We explore San Francisco, Muir Woods and Alcatraz on our Ultimate Day in SF with Alcatraz Tour — perfect for those with only one day to see everything. WHEN DOES THE NIGHT TOUR RUN? The Alcatraz night tour only runs twices Thursday – Sunday evening during Spring, Summer and Fall. The night tour of Alcatraz is unavailable during winter. HOW MUCH DOES THE ALCATRAZ NIGHT TOUR COST? HOW LONG IS THE NIGHT TOUR? It’s about two and a half hours. You don’t have an option of leaving early because there are only two ferries that leave the island on the night tour. And the first one heading back to San Francisco usually reaches capacity — so get to the dock early if you want to catch the first Alcatraz night tour ferry back to San Francisco. WHAT IS INCLUDED IN THE ALCATRAZ NIGHT TOUR? Your tour begins with a guided tour around Alcatraz Island — while the day tour just gets a ride straight to the island! There will also be a guided walking tour to the cell house before taking the Alcatraz audio tour. From there, parts of the prison that are normally closed off become open to the public — like the hospital! There will also be behind-the-scenes tours, cell door demos and other bonus walking tours. WHERE CAN YOU BUY NIGHT TOUR TICKETS FOR ALCATRAZ? No third party operators can sell Alcatraz tickets for the night tour. You can only purchase them directly through Alcatraz Cruises. Tickets to Alcatraz are notorious for selling out quick — and the night tour is no exception, so book early if you have your heart set on the Alcatraz night tour! Copyright © 2018 SF Excursions. All rights reserved.